Hobbies: Sewing, working out and spending time with family. Erica Bunker is the creator and editor of Erica Bunker, DIY Style! 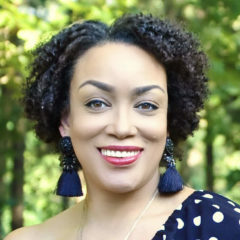 Erica is a Birmingham, Alabama based veteran blogger with over a decade of experience, with a solid audience and presence across all social media platforms. She is also a self-taught seamstress, advanced sewing instructor, burgeoning designer, public speaker, wardrobe stylist. Erica loves building her wardrobe through the art of sewing. She enjoys sharing how she pulls inspiration from the runway, fashion magazines and high-end ready-to-wear to create beautifully tailored, designer-quality garments with couture details. And not only will you find expert-level sewing, but also fashion savvy styling tips! Erica will show you how she gets the designer look without the designer price tag. Meet New BERNINA Brand Ambassador, Erica, of Erica Bunker DIY Style!